However, as CAMERA noted back in 2009 when AP first published the photo, the caption is extremely misleading. This caption gives the misimpression that the man is actually standing in front of the mosque, on the Temple Mount…[when] in reality, he is apparently standing at the top of the steps that lead down to the Western Wall. He is resting his left arm on something, most likely the wall at the overlook at the top of those steps. From where he stands, he is separated from the Temple Mount by the Western Wall plaza. Especially in light of the sensitivity of the site, there is a huge difference between an ultra-Orthodox man standing on the entrance steps to the Western Wall, an area next to the Temple Mount and completely under Israeli control, versus an ultra-Orthodox man standing in front of the Al-Aqsa Mosque, on the Temple Mount itself, which is under the day-to-day control of the Islamic Waqf. Of course, the misleading caption and photo (of an “ultra Orthodox Jewish man” pausing “in front of the al-Aqsa mosque”) serves an important editorial point for the Guardian. Beaumont’s article cites a “leaked” EU report on Jerusalem which alleges the following about the cause of “tensions” in Jerusalem. A second key factor identified by the report for the deteriorating security situation in Jerusalem is the continuing tensions over the Haram al-Sharif/Temple Mount complex, which it blames on “serious radicalisation” on both sides. 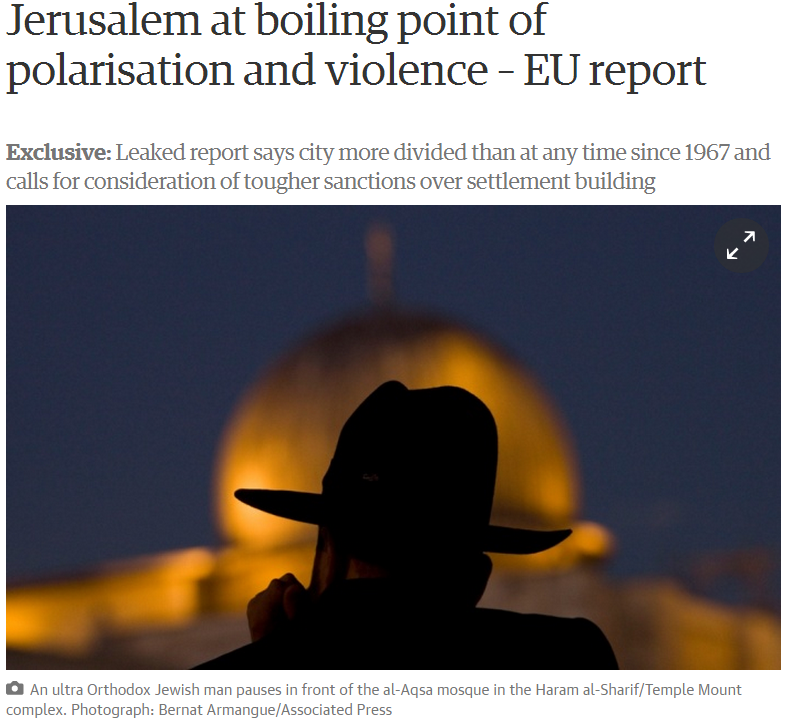 Guardian editors no doubt pounced on the chance to show a religious Jew allegedly “ascending” to al-Aqsa – illustrating the specific charge in the EU report. Even leaving aside the fact that the orthodox Jew in the photo was not where they claimed he was, the fact is that the aim of such religious Jews is to visit the Temple Mount (Judaism’s holiest site), not the mosque located on the greater Temple Mount compound. Guardian readers are led to believe that radical Jews are attempting to stir trouble and heighten tensions by encroaching on a site which is only sacred to Muslims. However, the “root cause” of violence in Jerusalem is not Jews peacefully visiting their holiest site, but, rather, continuous Palestinian rioting at the Temple Mount, and lethal Palestinian terrorist attacks against innocent Jews with guns, knives, hatchets and automobiles. The Guardian’s use of the misleading six-year-old photo once again serves to reinforce prejudices about Jerusalem, the Temple Mount and the root cause of violence in the holy city. So misinformation isn’t a reason for Middle East strife? How about crappy news reporting? For a paper that puts so much focus on Israel, you would think they’d be aware that Tel Aviv isn’t the capital. It’s a wonderful picture – extremely beautiful. It is saddening to see Mr Levick unable to appreciate the beauty in it. I think the photo is fine. The point is the Guardian’s inability to avoid drawing their own conclusions, especially since their conclusions are as fake as their insistence that Tel Aviv is the nation’s capital. If Peter Beaumont, et al, are going to playing those games while “delivering the news,” then they should expect the feedback that what “news” they bring to the table is more than likely bunk. But, yes, the scary Jew shadow guy, dominating the presence of the Dome of the Rock. Front page material. It is saddening to see that imbeciles like Eve are unable to connect the dots. You have taken the words out of her psychiatrist’s mouth. The Guardian depicts every Jew as an orthodox hook-nosed hairy beast as they learned from their ideological predecessors. Pictures don’t need even to translation from the German original. It’s a common photographic technique the kind that can be used to make it look like you’re a tiny person standing on the hand of someone in the foreground. The arches to the right of the dome cannot be viewed from the classic “me in front of the dome” viewpoint at the steps within the temple mount. A bit of CSI triangulation confirms the viewpoint as near the high-level NW entrance to the plaza from the shuk. The narrow depth of field indicates a long telephoto lens and the proportion of head to dome indicate a close man and a distant dome, rather than a gigantic head. All of this should be obvious to any reader of Amatuer Photographer, or press hack who works professionally with photographs and knows the area. The other main speaker at the PSC meeting I attended was Owen Jones, a fiery young writer and activist who is also now a columnist for the Guardian, perhaps the most prominent political voice on the left. He supports Labour and described the PSC as “pushing at an open door” regarding their agenda and the Labour leadership. “It wasn’t a conflict, it wasn’t a war, it was a massacre,” he declaimed, in the course of his anti-Israel philippic. Coming from an intelligent man, such a lack of nuance is alarming. I wonder if Jones would stand in front of the thousands of Israeli families who spent their summer huddled in makeshift bomb shelters and tell them that there was no war. Would he stand in front of the mother of 4-year-old Daniel Tragerman, who was killed by mortar shrapnel in southern Israel, and tell her that there was no conflict—simply a brutal massacre perpetrated by the IDF, in response to nothing whatsoever? The Jones perspective denies both Israeli humanity and Palestinian agency. There is no mention of trained Hamas fighters, only helpless victims. There are no Palestinian exterminationists, only Jewish ones. There is no nuance at all. If this is the voice of the new left in Britain, then the liberal Jewish exodus from the Labour Party will only continue apace. Because if Israel is accepted as unquestionably evil on the British left, then you can be a liberal, or you can be a Zionist, but you can’t be both. You can be a faux-‘liberal’, or you can be a moral human being, but you can’t be both.